It is now time for us all to take responsibility into our own hands - our government doesn't look like it is about to lead the way so we need to. Carbon emissions are just one of the aspects of our lives that need immediate attention. The low Impact Living Initiative (LILI) is an environmental organisation founded in 2001 They help people to reduce their environmental impact through a series of hands-on practical courses. Many of these courses promote self-made solutions and the use readily available materials that can mean great savings on technology that is otherwise overpriced. The use of wood for heat (very applicable to people on the Stovesonline website) is just one of their useful courses. For further information please visit the Low impact Living Initiative website. How to make biofuel - making your own carbon-neutral biodiesel on small and large scales using readily available materials. The legal aspects, engine considerations and much more. 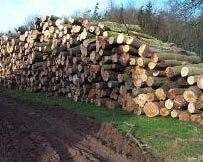 Heating with wood - A course covering how to obtain your wood, cutting it, storing it, how wood burns, moisture content, stoves - new, home made, and much more. Low-impact smallholdings - this course covers finding suitable land, buildings and planning permission, managing the land, the infrastructure needs, environment and ethics, paperwork and legal considerations for people wanting to establish smallholdings. Self-build solar hot water - a course which shows you how to make your own solar hot water system - you will walk away with a completed solar hot water system that you can install yourself. Building with straw bales course - straw bales are relatively cheap and fast to build with and also have huge insulation values which means you get a very warm house.